MSE Creative Consulting Blog: Tornadoes "Unpredictable"? Hardly. Two weeks ago a national news story ran that pronounced tornadoes "unpredictable." This may have been true to a significant extent as recently as 15 years ago but it is certainly not the case now. I'm going to present some of the forecasts of the tornadoes in the Carolinas -- well outside of tornado alley -- to illustrate my point. 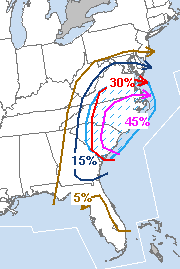 If you were reading this blog Friday afternoon (the first tornado in the Carolinas touched down at 2:08pm EDT Saturday) you saw this map generated from NWS storm probabilities. The hatched area indicated where significant (F2 or greater on the Fujita Scale) were likely to occur. The NWS issued its routine public severe weather outlook at 2am EDT Saturday morning (12 hours and 8 minutes before the first tornado). Here is the forecast (the red line is the higher risk area) compared to the actual reports of severe weather (red triangle = tornado). One hundred percent of the tornadoes are in the outlook area and 98% are within the higher risk area more than 12 hours in advance! The National Weather Service issued two more public updates between the forecast above and the first tornado. When it came time to issue the tornado watch, they issued a rare "particularly dangerous situation" (PDS) tornado watch for the Carolinas (there was a regular tornado watch farther north). There are years where not a single PDS tornado watch is issued. It was out 1 hr. and 3 minutes before the first tornado touched down. Note (lower left) that the risk of both tornadoes and ≥F2 tornadoes is rated "high." This is important because the vast majority of fatalities and injuries in tornadoes are caused by tornadoes of F2 or greater intensity. I do not want to go into each of the warnings because that would be far too long of a posting. You can see for yourself by going back to yesterday's postings and scroll up (forward in time). I believe you'll be very impressed with the amount of advance warning. So, why did people die? Given the sheer number of tornadoes and the strength of the tornadoes combined with the population density of the affected areas, some deaths were inevitable. I'm told that most communities in North Carolina do not have tornado sirens, which might be a factor. It is too soon to know if everyone received the warnings in time (i.e., in the 2007 Greensburg, KS tornado, everyone but a trucker from California received the warning as far as can be determined). The NWS will likely make these determinations via their damage surveys. Based on early news reports, at least half of the deaths in North Carolina were associated with mobile homes. A helicopter shot I saw clearly showed at least some nearby mobile homes were not tied down. It is my opinion, based on years of study and research, that an untied mobile home is completely unsafe in a tornado. may have tumbled as it moved. While we do not know for sure, the most similar tornado outbreak to Friday and Saturday's was the 1884 "Enigma Outbreak" which began in Mississippi and ended in North Carolina. The death toll in that outbreak may have been as many as 1,200! The two day death toll in 2011 will be about 50 or a perhaps few less. Now, I want to emphasize these are unspeakable tragedies for the people involved and our hearts go out to them. But, there is no doubt that the effective forecasts and warnings likely saved hundreds of lives. We are getting to the point in America that the issue is not so much whether there will be an advance warning but making sure that everyone who needs to receive the warning gets it. Thank you Mike so much for your coverage this spring on all the tornado's. You provide more of an in depth understanding. I want to say I watched the NC governors speech on online (Raleigh TV)to the media concerning the disaster in her state. She said some(maybe communities)did not get warnings? I hear this from politicians all the time. Rare is the politician like Mo. Gov. Nixon who gives credit to excellent warnings ( http://meteorologicalmusings.blogspot.com/2011/01/thank-you-missouri-governor-nixon.html ). That said, Gov. Perdue may mean that power was out and the warning did not arrive due to no electricity, etc. That is why I wrote this posting. The warnings (while perhaps not perfect) were very good in demanding circumstances. It is time for the meteorological profession to get some of the credit it deserves. That is why I wrote my book, "Warnings" and I continue to try to get the word out. we been in Marshalls in Raleigh this time,but no warning signal..??? than after 1 hour we arrived home in Spring Lake and after 30min we lost a power. I know we have hundreds of new readers as a result of the tornado outbreak. This is a non-political blog and I just did one of my rare comment deletions because it was political was not related to the subject of the posting. Please feel free to make comments that agree or disagree with my postings but the comments must be related to the posting. Absolutely amazing job with providing this information to the public. All you can do is put it out there. However, too many people are complacent and don't take these things seriously. (It won't happen here attitude.) I was in the tornado outbreak of May 31, 1985 in Eastern Ohio...I know what it's like. I'm a weather geek now, but you'll never catch me unaware of a dangerous weather situation. Prayers to all who lost so much, and KUDOS to the NWS and storm prediction center. Good Job... warnings and information getting to the general public is about the BEST that we can do... and yet there will still be those jokers who sit in their vehicles in harms way to get a 'close-up'... I just shake my head. Honestly it's not that the people aren't receiving the information. They're simply apathetic to it. "When it's my time it's my time" is what I hear most often when I issue my own personal warnings to people. Not only are they themselves not paying any attention, they shrug it off when you deliver it in person. You would think with the popularity of such programs as Storm Chasers et al, the public wouldn't be as apathetic to warnings, as Dr. mentions above. 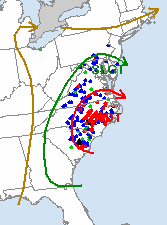 Unfortunately in some areas that rarely experience tornados/severe wx; like NC, the warning systems are lacking. Here in Michigan where tornados aren't exactly something we see every Spring, we still have sirens in place for just that purpose and thankfully, tested every month. With spotters/chasers and the relatively new addition of social media outlets like twitter, more people are receiving those warnings...at least one would hope so. There will always be casualties from severe wx, regardless of the steps taken to warn people. I'm sure a lot of people who visit your blog saw the video from NC where the guy was sitting in his pickup truck, filming a tornado slice through a Walgreens. The tornado couldn't have been more than a 100 yards from the camera. Luck was on that gentleman's side. I'm not sure if you could categorize that as deliberate stupidity or not, but it's that kind of apathy or lack of common sense that plaques people who believe bad things will never happen to them. I'm in agreement that lives have been saved through the hard work of spotters, chasers and of course the NWS/NOAA. People will always build on cliffs, too close to shorelines, in the middle of flood plains and of course, marvel at the power of tornados...without realizing the dangers posed. Mike, as a fellow member of the severe storms forecasting community, I want to thank you for that post. As you noted in your book, the integrated warning system (while not perfect) has improved dramatically from the days of tornadic carnage in the 1950s. As long as the science still has questions to answer, as long as observations are sparse, as long as secular distractions (equipment failures, bureaucratic meddling, logistical problems, etc.) occur, there still will be uncertainties and missed forecasts. Perfection is impossible, whether in accuracy or precision. We severe weather forecasters only can aim for a goal of consistent excellence and diminishing uncertainty, while learning more and more from the fewer and fewer major failures. Public or private, that's our common goal--to get better all the time in the effort of excellent service to our constituents or customers, knowing we never can get it totally right every time. I wonder how much of it is people dying due to the myth "the weather forecaster is always wrong" therefore warnings were ignored. I have heard of a study that found this is a reason for storm-related deaths but never seen it. Sad to die over believing something that is provably not correct. Great post, Mike. I am curious how you were able to overlay the SPC storms reports with their outlook. I have been wanting to do this, but have not figured out how to accomplish this.